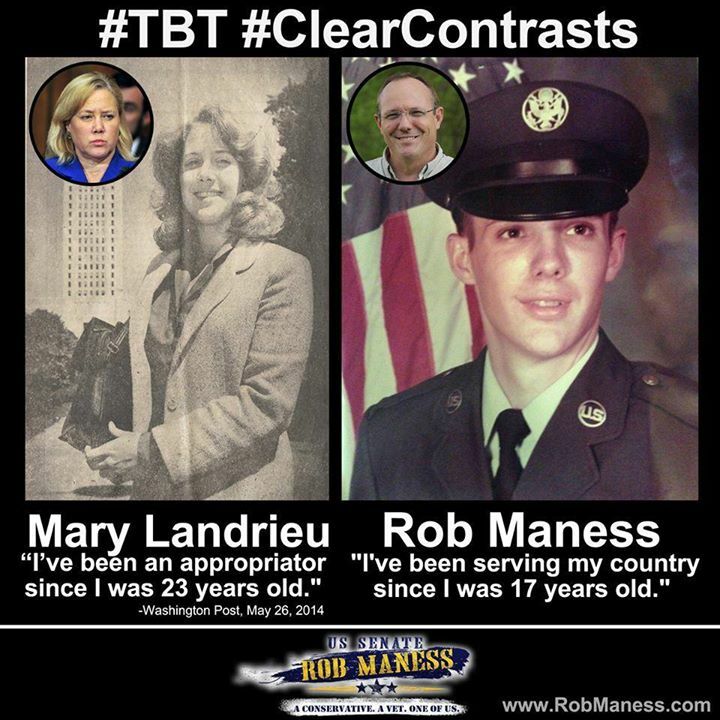 #TBT and #lasen update – Help this fighting conservative vet gas up his truck! Could there be a clearer contrast candidate than Col. Rob Maness to take on liberal Mary Landrieu in Louisiana this year? On the one hand you have a liberal career politician who’s voted with President Obama 97% of the time and charged taxpayers over $100,000 in private jets and luxury staff retreats. On the other hand you have a retired decorated combat vet travelling the state in his Ford F-150 holding “Solutions For Us” town halls unveiling common sense conservative ideas to fix the VA, lower unemployment, protect life, and improve education. Col. Maness is a conservative, a vet, he’s one of us, and he’s our best bet to take on Mary Landrieu this fall. Please kick in some gas money to keep this fighting vet’s truck fueled till November! ← Gov. Palin: Vote “yes” to Proposition 1 and say “yes” to Alaska’s future!